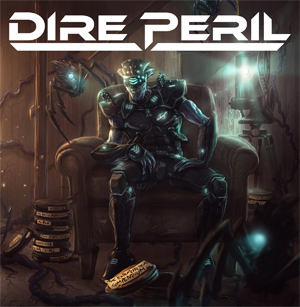 American sci-fi power metal duo DIRE PERIL featuring Jason Ashcraft (HELION PRIME) and vocalist John Yelland (JUDICATOR) are premiering their latest music video "Blood In The Ice". The song is their third single off their upcoming album The Extraterrestrial Compendium, due out November 9th, 2018 via Divebomb Records to follow their three previous EP releases Astronomical Minds (2013), Queen of The Galaxy (2014) and Through Time and Space (2015). Check out the "Blood In The Ice" video on KNAC.COM HERE. "The album takes you on a journey all based on different sci-fi films. From fast aggressive right hand attacks (in style of ICED EARTH) to softer acoustic passages." adds Jason Ashcraft. The digital album is available for pre-order on Divebomb Records, DirePeril.com, Bandcamp, Amazon, iTunes. First single, "Heart of The Furyan", based on the The Chronicles of Riddick series, specifically the third installment Riddick can be heard on Youtube, Bandcamp, Spotify. Lyric Video - "Queen of The Galaxy", featuring UNLEASH THE ARCHERS vocalist Brittney Slayes, whom reprise’s her role as Barbarella for a re-recorded version of the track can be watched on Youtube. "Altair IV: The Forbidden Planet"